Cabrillo, originally uploaded by navandale. Cabrillo National Monument is the southwestern-most point in the United States. I recently visited San Diego as a part of a tour with the University of Nevada, Las Vegas Chamber Chorale, for which I am the Graduate Assistant and tour manager. It was a long and enjoyable tour, and we sang at numerous amazing venues, including the Mission Basilica San Diego de Alcala... the oldest church in California. I've been wanting to do more long-exposure images of waves on a rocky shore, so when I got the opportunity to make my way here, I jumped at it. I knew that I would have to cross a military base to get to the monument, but I didn't think that I'd have to clear security. Well, I took a taxi from my hotel, and after $30 we arrived at the guard shack at the gate to the Naval base. The guard told us that the park was closed, to which I replied, "Oh, I know, we're not going to drive in the park. He's going to drop me off and I'm going to walk down to the shore and do some night photography." She said, "It's a bit dark for photos, don't you think?" "Actually, I think it's perfect. We have a nearly full-moon, and that's why I have a tripod." She could tell that I wasn't going to hurt anything, so she let me through. I then walked down to the shore, making sure not to veer onto any coast-guard or navy property. I found a promising composition close enough to the break that I knew I'd get some cool images, but far enough away that my camera wouldn't get wet. I was wrong. As I looked through the viewfinder I was blasted with a surprise spray from the crashing wave below, and got absolutely soaked. I was less concerned about my cold, wet jeans than I was about my camera. 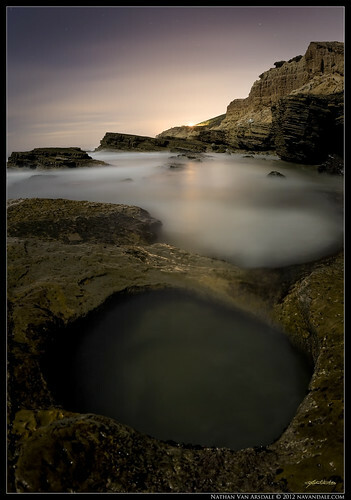 I retreated up the rocks to dry land and proceeded to dry off my camera and clean my lens. Not wanting to repeat my folly, I continued along the shoreline until I found this nice little cove. "This is perfect," I thought. I climbed down and set my camera up facing north towards the orange sky. I first captured the scene at a high ISO with a 30 second exposure, just to make sure I would like the composition. Then, I used my handy exposure-calculator app on my DriodX to determine how long my long-exposure should be at a low ISO and higher aperture. Happy with the images I captured, I decided to head on back. It was, after all, nearing 1:00am, and I had to sing in the morning. Unfortunately, there was zero signal for my phone. As I walked back, I tried to call the taxi driver to let him know to come pick me up, but the call kept dropping. Not 100 yards into my uphill trek I saw approaching headlights. As the lights got closer I could see that the vehicle was a truck... then I could see it was a police truck. I politely waved and intended to just keep walking, but the police truck stopped. The window rolled down, and I knew I would get some sort of talkin-to from the authoritar, but then I heard a gregarious female voice greet me. It was the guard from earlier. She was relieved from her shift, so she figured she would come make sure I was ok. Awful nice of her. Even nicer, she then offered me a ride back to town. SUPER LIKE! I hopped into the back of her cop-car, and must say that I never pictured my first ride in the back of a police vehicle as being so pleasant. We chatted a bit when another pair of headlights came our way. I muttered, "I think that's my taxi" as it drove past. "Maybe you should flash your lights at him" I suggested, but it was too late. We passed each other. So, she turned around, turned on her cop-lights, and chased him down. I could only imagine his confusion and anxiety at the oncoming lights. I thanked the nice officer, and got in my cab to head back to the hotel. After apologizing to the cab driver, he informed me that he saw my number on his caller ID, and assumed I was ready to be picked up... I love how things work out! This is not an HDRi, as many of my images are. This is a single exposure facing north. Viewing this image large allows you to see the star trails, and exquisite detail throughout. The light in the background is from what I believe is a streetlight. The only editing I did to this image was a tiny bit of sharpening, and a tiny contrast adjustment.